I couldn't find this with help or search and it's been a nuisance so i'm asking it here. Both my polar scopes invert and reverse image. Which way does the polaris hour angle show in Kstars? A cup of I-coffee to responders! Replied by Blueshawk on topic which way is the polar hour display representing? I think therefore it is showing correctly for inverted backward scopes. p.s. This is mostly a post to remind us absent minded people. Replied by Ihoujin on topic which way is the polar hour display representing? Understanding how the polar scope works is a useful skill. Given that the pole scope is inverting, when viewed, the 6 o'clock position is truly representing the transit position, or 12 o'clock in the sky. You mount will have a dial and date markings. It actually functions as a calendar and clock so you can find the hour angle entirely manually when calibrated properly. Place the Polaris mark at the 6 o'clock position then set the dial to 12. There is a set of delineations for north and south hemisphere. You need to identify which corresponds to your location. You may refer to an app that illustrates it with the hour angle. 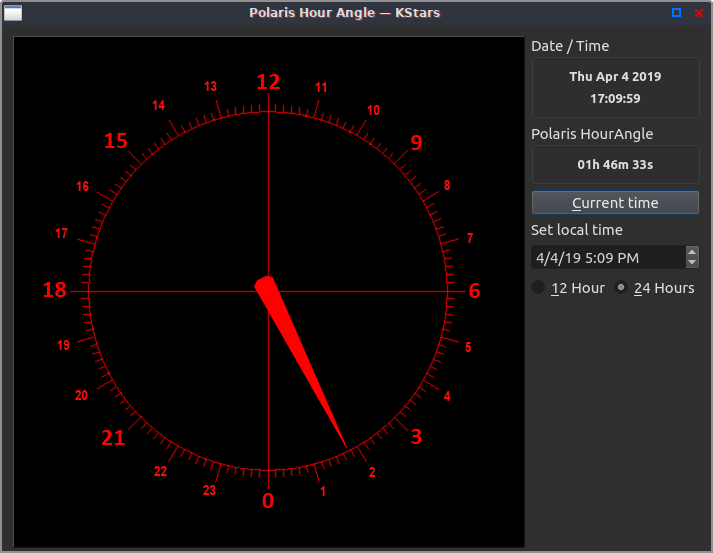 Now if you know what the hour angle for Polaris is at the moment, you can simply rotate your mount to that time on the dial. Thanks for the input @Ihoujin. I figured it out but wanted to leave this to help others too. This is one I've seen a great may people struggle with, and for good reason. There is more than one reticle and subsequently more than one method. 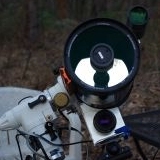 Some polar finders show a bubble to align to using the above description and the RA setting circle, once the reticle is calibrated to the correct angle as above. This was the situation on my CG4 once I bought a polar scope for it but the EQ6-r comes with one installed and the new reticle shows the hour and three concentric circles. My question (which the title didn't say) is more related to the one shown in KSTARS polar angle calculator. Turns out the EQ6-R polar scope reticle matches this screen pretty well and I was able to set from it directly without flipping. I don't have any screen at the scope so it didn't occur to me until I questioned it. My AHA moment was realizing the numbers are already flipped to show a direct representation in reticle. I found this in another forum but am pretty sure it't from the SW manual: "Rotate the r.a. axis of the mount to put the 0 oclock of the reticle at the highest position in the FOV of the polar scope, then place polaris at the correct clock position given by the hand controller or other device." The synscan controller would give me the time in numbers if I had it on the unit but i'm using an ftdi cable direct to the indiserver sbc. The 12 hour version is showing my local time on the hand, and GMT on the digital readout while the 24h reticle shows gmt in both places. Ouch... I think what confuses this is that there are at least 4 different versions, setting circle, time reticles north and south star angle estimators. and lots of different version in apps all over. It's no wonder people are confused. I think the simplest answer if you have a clock reticle is to put polaris to the spot in your reticle where the red thing is pointing... THat is unless something is flipped/notflipped in the app or reticle. People really should include a caption for that in their apps. For me the numbers line up. Last edit: 2 weeks 1 day ago by Blueshawk. Hour Angle will be in a 24h format with delineations on the mount. The 12 hour format is the P.Scope, marked within some polar scopes. Important difference is with Hour Angle, the zero point indicator is down and watch hour goes counterclockwise (in the north). The zero point is at meridian passage when Polaris is directly above the pole. With Zero down, 12 will be at the top of the dial. With the P.Scope watch hour 0 is up. Example is the Star Adventurer polar scope. It has been factory set to the correct orientation. Personally I prefer working with the Hour Angle because it is easy to calibrate. Begin with polaris in the center crosshairs, then with the altitude bolts, move polaris straight down to the larger circle. Next rotate the RA axis to place the smaller circle (or similar Polaris marker) over Polaris. Then set the dial to 12 and rotate the RA to the correct hour angle. Finally use the Alt/Az bolts to place Polaris where the markings show. You should be able to get ~5' accuracy or better. There are of course other features built into a polar scope to find it manually when you do not know the hour angle I won't get into now. Last edit: 1 week 5 days ago by Ihoujin.